A Data Economic Impact Report commissioned by the Smart Dubai Office estimates that open and shared data has the potential to add 10.4 billion AED (US$2.83b) to the economy every year, by 2021. This contribution is in terms of Gross Valued Added (GVA), which is a measure of the contribution to an economy made by a firm, sector or activity. GVA is directly linked to Gross Domestic Product (GDP). it excludes taxes and subsidies on products/ services. 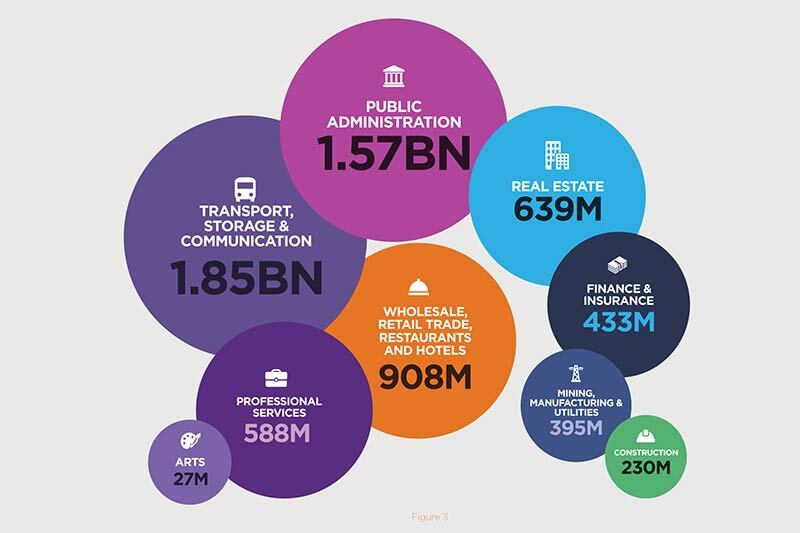 The three biggest value drivers are expected to be the transport, storage and communication sector; the public administration sector; and the wholesale, retail trade, restaurants and hotels sector. The report estimates opening government data alone will result in an added value in the range of AED 4.3 to 6.6 billion (US$1.2-1.8b) annually as of 2021, equivalent to approximately 0.8% to 1.2% of Dubai’s forecasted GDP for 2021. These numbers were calculated through a benchmarking approach, drawing on evidence of the impacts from other jurisdictions. The applicability of findings to Dubai considering differences in consumer and business behaviour was considered. The report notes four categories of entities (citizens, private sector; or government bodies) who will create value: 1) Data Enrichers, who combine open data with their own sources and or knowledge; 2) Data Enablers who do not profit directly from the data, but do so via the platforms and technologies they are provided on; 3) Data Developers who design and build Application Programming Interfaces (APIs); and 4) Data Aggregators who collect and pool data, providing it to other stakeholders. Geospatial, environmental and meteorological and economic and business information data are expected to generate the greatest value from use and re-use. The report also identifies a few barriers which could obstruct the realisation of potential value. Legislation could limit data transparency through disclosure policies or reduce clarity of ownership of datasets through copyrights. It is not enough to open up data to realise economic benefits. To be valuable, data must be accessible, discoverable, timely, linked and available for re-use without discrimination. Charging for datasets could be a barrier for SMEs and individuals with financial constraints. Moreover, there could be access barriers resulting from the format and reliability of data, the reluctance to use data, and the lack of skills and understanding. The Dubai Government is addressing these barriers through the right policies and standards, enabling data sharing through the Smart Dubai Platform, and raising the necessary skills. In March 2016, the Dubai Data Establishment Law was established to lead the Dubai Data initiative, which is described as a comprehensive city-wide data initiative guiding the opening and sharing of city data across the public and private sector. In April 2017, the ‘Dubai Pulse’ platform was launched to host all of the emirate’s data. Some of the data is available free of charge to the public. A second layer offers analysis of the data in exchange for a fee, while the third layer consists of data accessible exclusively to Dubai Government entities.